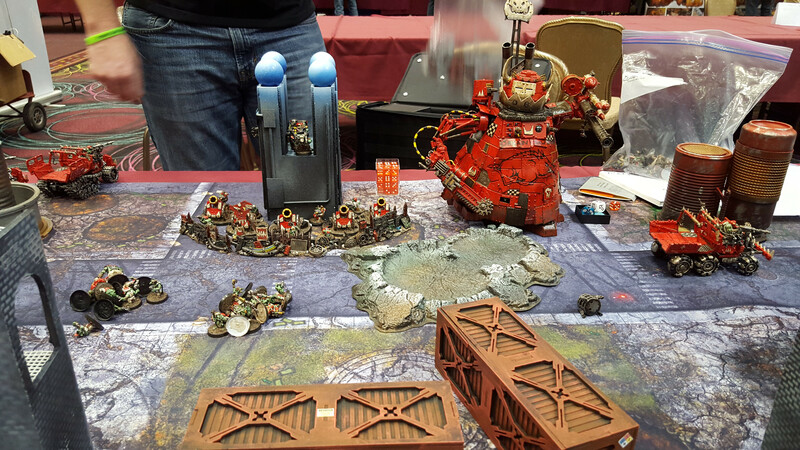 So this was the first time I went to LVO and I want to say first off that I had a blast. The Frontline crew ran an excellent event and I’m going to try to make it next year! 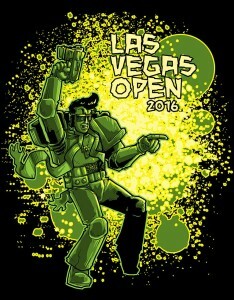 My personal goal for the LVO Championships was to go 4-2, but I would accept a 3-3 finish. I figured those were reasonable expectations, especially since I went 4-2 at Battle for Salvation in October with my Seer Council. Though, for a week before the event I kept flipping what army I was going to bring. If you saw our first Battle Report you would know that that game started my constant flip flopping. But in the end I decided to bring my Thunderstar List. I was running the Librarian Conclave as Iron Hands for that tasty 3+ Feel No Pain if I ever got Endurance. This was the first time that I’d ever gone up against a Stompa, let alone a extremely discounted Stompa. I rolled for powers and got squat. First game of the tournament without Invis, even though those Meganobz in the Bullyboyz formation look super scary I was thinking I’d still be okay. So we rolled off and I won the roll to go first or second, I decided to go second because I wanted to see what Grover would do with setting up that Stompa. Grover deployed his VSG in the center and put a squad of Lootas on the battlements and his 5 Mek Gunz in front of that. The Stompa was to my right (Grover’s Left) of the VSG. I deployed my Thunderstar in the center. I chose not to scout. First turn Grover shoved his Bullyboyz into my face. I tried to blow up the closest Bullyboyz’ trukk with shooting but since he made me jink I was only able to do a few hull points to it. So my assault phase I charged and blew it up. Turn 2 Grover charged my Thunderstar with all of his Bullyboyz units. For the life of me I thought Nobs were base S5 so his powerklaws would be S10. Grover informed me that they weren’t and only S9 on the charge. So my thinking of we’ll have a fair trade or maybe I’ll really hurt went to me wiping out his Bullyboyz. My turn I moved right into his stompa’s face and got a long charge and blew it up. He did however Stomp out some of my Iron Priests so my Thunderstar was hurting a little bit. In the end that was the most eventful parts of the match. While my Thunderstar was taking out his big nasties he was moving into my back field to take my Emperor’s Will. After I took out his VSG and cleaned up his back field I sent my Wolf Guard Battle Leader to huff it over to my board edge and help out my scouts. I knew this would be a long shot as when I started to move the Wolf Guard Battle Leader, it was turn 5. Luckily we went the full 7 turns and I was able to make a 10 inch charge with fleet and take out his obsec Gretchen on my Emperor’s Will Objective. Had the game ended turn 5, it would have been a 3-0 win me. Turn 6 a 7-0 win for me. But at the end I managed to max out. It was a great game and a good start to this great weekend. Hopefully I’ll see Grover with his Orks at the NOVA Open this year as he was saying he was interested in attending! Oh yeah and a picture of his Stompa, it was really well done! This game was really quick because I did a dumb mistake. I didn’t get invisibility (again) and Matt had first turn. I figured since the Wraithguard didn’t have an Archon with Web Way Portal that my Thunderstar would be okay and decided to scout up. I don’t know why I did that. My thought process must have been I’ll scout onto the relic and claim it, forgetting that Matt had turn one. So after Matt moved his Wraithknight up to charge me, I then saw him move up his raider with D-Scythe Wraithguard and it hit me. I’m an idiot. I even looked at Matt and said “why the hell did I scout?” To which Matt said “yeah, I thought that was odd.” Oh well! Matt proceeded to flame me and take out most of my iron priests because I couldn’t roll a 4+ invulnerable to save my life. Matt charged his Wraithknight in taking out another Iron Priest because no Cyberwolf wanted to look out sir the Wraithknight’s Strength D roll of a 6. I then Hit and Ran out. But at that time I had lost so much of my star to a dumb scout move, that Matt took serious advantage of, that it was over. I tried charging his Wraithknight again to see if I could maybe kill that and deal with his Wraithguard but the damage had been done. Matt was just going to be cleaning me up and we called it. So I FINALLY got Invisibility, which was helpful for this game. I won the roll for deployment and decided to go first. I figured if Richard was a normal Tau player he’d castle up in his corner so I’d scout, move, run and see how well his first round of shooting would be. Richard however decided to Deep Strike everything except for a Ghostkeel that he put in his corner. It was far enough away that I wouldn’t be able to get a first turn charge and “table him.” As the game progressed Richard told me that he played a very similar list at a recent RTT, so he kind of knew how to play against the Thunderstar. Turns out the person he played is a good friend of mine James who was actually texting me during this game. It was pretty amusing once I started thinking about it. Anyway, I managed to kill the Ghostkeel on Turn 2, but at this point a few more Ghostkheels came in. The rest of the game involved Richard playing keep away from the Thunderstar and making me run across the board. Meanwhile he was throwing Marklight units in front of me to block my moves and charges, units of drones being worth no Kill Points in a kill points mission is annoying. All while this was happening Richard was managing to take out my scouts, Dark Shroud and an Iron Priest here and there. In the end I believe Richard had 5 kill points to my 3. He was also able to get more maelstrom (shocking I know!). But I was able to secure first blood. Regardless it was a good game and really showed that a singular big unit, while funny, isn’t good overall in a singles event. But what do I know? Aaron Aelong did really well with his in this event! Well that was my day one! I would have a lot of work to do to get to my goal of 4-2. 3-3 looked more reasonable as I’ve never gone 3-0 in a day yet. But who knows? Day 2 is a new day and you never know what could happen! With that, I’m going to get day 2 and 3 out sometime next week. Sorry for the lack of pictures during my games, I really was caught up playing and didn’t really think to take any.